Living in Texas for 20 years, we are always looking for a way to stay cool. We stay cool in the pool, in the movie theaters, sitting in front of a misting fan, we wear thinner clothes, we splash water on our faces, we draw curtains, we run fans (even if we have air conditioning), we cook outside often to keep from heating our homes up, or we stay cool eating cool foods on a hot summer day. Just returning from Chicago over the weekend and enjoying 70° temperatures, we were faced with our 102° reading on our car thermometer. Well, so much for sleeping under blankets and grabbing a jacket before going out for dinner at night. 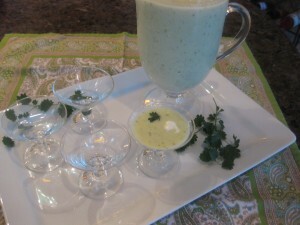 We are back to our “heat” of Texas and this Cool Cucumber Soup will keep you cool and wanting more. 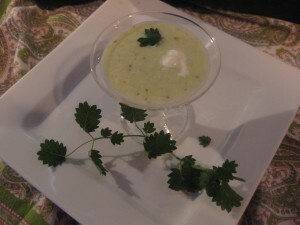 Some day I’m going to make my cucumber sandwiches that I love so much and have it with this cucumber soup. I love cucumbers and I would be “as cool as a cucumber” I think if I had this for lunch one day. I was going to serve this to friends in my little 2″ martini glasses but decided the soup was so delicious we deserved more. So, I used larger martini glasses and we used a spoon to eat it instead of sipping the soup. I didn’t use the large cucumbers that go into salads and the store was out of English cucumbers which I would have used. These weren’t pickling cucumbers either and I don’t think they were Derby cucumbers. There were 5 small cucumbers in a package. They were about 5 inches long. If you can’t find these, I would use about 3-4 cups chopped cucumbers. If the soup is too thick, you can always thin it with chicken broth. 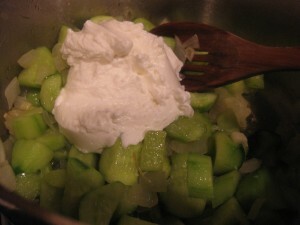 This particular recipe called to saute the onion and garlic a little and stir in the cucumbers and saute a little more. I think this step kind of brightens the cucumbers up a little. I finished this off with a dot of the creme fraiche I had left over from making my Coconut Banana Puffs. If you draw a toothpick through the circle you will have a little heart of creme fraiche floating in your soup. I garnished this soup with salad burnett which is a herb that has a cucumber taste. And, I love the look of it on anything. Heat the oil in saute pan and add the onion and garlic and saute for 7-8 minutes on medium-low heat (not browning) until the onion is transparent. 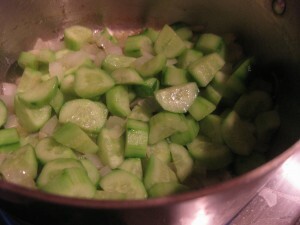 Stir in the cucumbers and saute for about 3-4 minutes. Pour this mixture into a blender with the buttermilk (and/or yogurt) and the chicken broth. Blend until you have everything smooth. Chill, stir in basil (or salad burnett) and salt and pepper to taste. You can adjust the consistency by adding a little more broth. Garnish with creme fraiche and serve in your favorite bowl or martini glass.